The fascination of the macrocosms, the awesome power of the atoms and the energy of matter. In a chemical reaction 1 ten billionth of mass is changed to energy. In a nuclear reaction in a nuclear fission bomb about 0,1 percent of the mass is converted into energy. This is the origin of the awesome power of nuclear weapons. Complete fission of 57 grams of Uranium converts approximately 0,057 grams of mass to energy yielding an energy release of 1 kiloton TNT. This requires about 1,3 x 10°23 fissions. The release of nuclear fission energy is the result of a very large number of events, each of it releases a miniscule amount of energy. Total conversion matter to energy: 21,47 Megaton per one kg of mass, 1 gram of mass is equal 22 kt TNT. This is about the energy released by the Nagasaki bomb. A 100 megawatt powerplant needs 10 days and 15 hours continuous running to produce the same amount of energy. The most efficient pure fission bomb possible would still only consume ~25% of its fissile material before being blown apart, and can often be much less efficient. Fat man in Nagasaki had an efficiency of 14%, that means 14% of the Plutonium underwent fission. The rest of the plutonium decayed partially to other elements or remained in the environment with a half-life of 24100 years. (Little Boy had only an efficiency of 1,4%) .The total complete process of bomb explosion, from the release of the first neutron to the total energy release is about one millionths of a second, or a microsecond. During this time about 81 fission generations occured. The characteristic time for one generation, a hundred-millionth of a second, is called a shake. 99,9 percent of the energy is released in the final 10 generations. In June 1946 the US stockpile consisted of only 9 Fat Man bombs. The bottleneck was the plutonium production in Hanford, hampered by high neutron flux in the reactors. Therefore improving fission bomb design would bolster the US nuclear arsenal. 1946 presidental approval was received to conduct an atomic bomb test series starting with operation crossroads. Thus until 1962 the area of atmospheric testing began. These test series were grand operations, involving huge numbers of peoples. Military officials still knew very little about the effects of nuclear weapons. 1948 Operation Sandstone on Enewetak Atoll concentrated on bomb performance and the validation of three new weapon designs. As successful as sandstone was, logistics, weather, and safety concerns leaded to thinking about a continental test site. In1951, Ranger was the first test-series on the Nevada proving Grounds. After the first soviet A-bomb Joe 1 in September 1949 the nuclear race accelerated. Development of the next generation of nuclear weaponery to thermonuclear devices, which could increase the explosive yield a hundred or even a thousendfold would restore the absolute advantage. 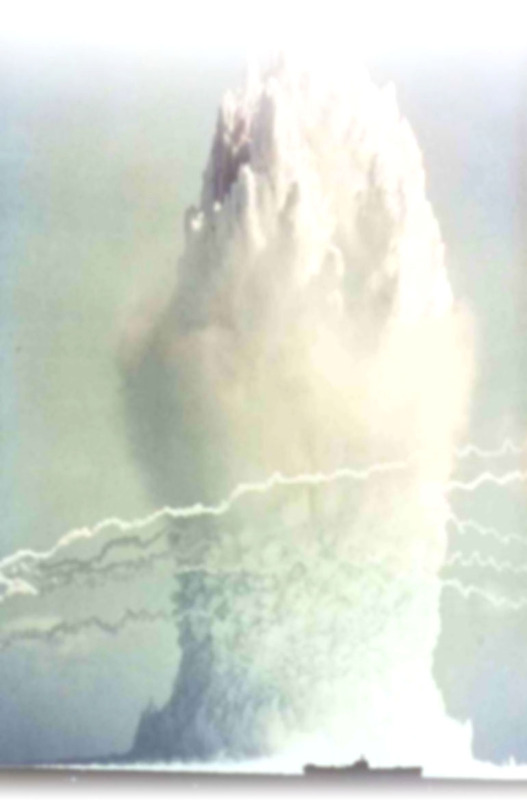 Further nuclear testing was essential in determing the feasibility of the Super. Codenamed greenhouse in 1951 two of the four planned tests should explore some of the principals of fusion. The US Department of Energy, in cooperation with the Department of Defense, declassified a series of historical films on the nuclear weapons program. These video programms are the best visual history of the atomic bomb. They show preparations and many of the detonations filmed by secret Hollywood film crews.These videos document the history of the development of nuclear weapons, starting with the first bomb tested at Trinity Site in southeastern New Mexico in July 1945.The Historical Nuclear Weapons Test videos can be downloaded and viewed on the windows media player. It had been proved that mass and energy were equivalent. It had also been proved that the neutrons initiating fission of uranium reproduced themselves in the process and that therefore a multiplying chain reaction might occur with explosive force. To be sure, no one knew whether the required conditions could be achieved, but many scientists had clear ideas as to the problems involved and the directions in which solutions might be sought. Fears that Nazi Germany would build and use a nuclear weapon during World War II triggered the start of the Manhattan Project, which was originally based in Manhattan, New York. Under the auspices of the Manhattan Project, three main research and production facilities were established at Oak Ridge, Tennessee; at Hanford, Washington; and at Los Alamos, New Mexico. The Oak Ridge Laboratories provided uranium-235 and Hanford produced weapons-grade plutonium, the fuel of the fission bomb. The Los Alamos Laboratory became the site for assembling nuclear weapons. The Manhattan Project, as it was code-named, cost about $2 billion at a time when the average annual per capita income in the United States was around $1,000. the project involved hundreds of engineers, machinists, technicians, photographers, secretaries, police officers, drivers and builders -- military and civilian. And it could not have been done without the wealth of the American government and the ingenuity of American industry. More than 100,000 civilian workers were involved in making the materials for the first atomic bombs. The director for all the sites -- Tennessee, Washington, Idaho as well as New Mexico -- was a military man, Maj. Gen. Leslie R. Groves, who had supervised the building of the Pentagon. Los Alamos produced four weapons, two of which, Little Boy and Fat Man, were used against Japan in August 1945. Unique was the investment of hundreds of millions of dollars in unproven processes. By the end of the war approxymately 2,2 billion dollars had been expended by the US on the atomic bomb.It took 25 years to surpass this effort with the US Apollo-programm, which led to the first step of mankind on the moon.